Wayfair CEO Niraj Shah discusses the company’s public debut, and the business of online retail. Wayfair (NYSE:W), the online furniture retailer, soared 24% in its debut on the New York Stock Exchange Thursday morning. The company raised $319 million, after pricing shares at $29. Trading recently at around $36 per share, the company had a market value of about $3 billion. Wayfair, whose sites include Joss & Main, Dwell Studio and Birch Lane, was founded in 2002 by Steven Conine and present CEO Niraj Shah. 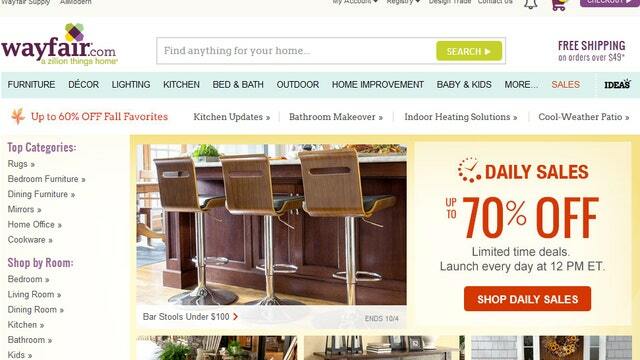 The Boston-based company changed its name from CSN Stores to Wayfair in 2011.
Business has been booming for Wayfair. The sites have a selection of seven million items in the furniture and decor category and annual revenue was up over 50% to $916 million in 2013. In a phone conversation, Shah told FOX Business that it differentiates itself from competitors, in part because of its focus on visual merchandising, an important aspect of the decor business. Shah also says they aim to have competitive pricing. Shah says they timed their offering to be a couple weeks after Alibaba, another e-commerce company that went public last month in the biggest IPO ever. “You’d have to fight for attention with Alibaba if you’re on the road at the same time,” says Shah. Wayfair previously raised $358 million in financing from venture capitalists including Battery Ventures, Great Hill Partners and HarbourVest Partners. Founders Shah and Conine have the greatest stake in the company, each at 28%. Goldman Sachs (NYSE:GS), Citigroup (NYSE:C) and Bank of America Merrill Lynch (NYSE:BAC) were underwriters on the offering.